THE HOUSE THAT LOVE BUILT is the second contemporary Ms. Wiseman has written. I didn’t quite enjoy it as much as I did Need You Now, but it still sang. Brooke and Owen are both still madly in love with their former spouses, one lost to death, the other to divorce. Owen put a lot of effort into doing things to spite his ex-wife, and maybe if he’d put that much effort into being a “yes-man” and trying to please her, they could’ve stayed together. Also, Brooke is very bitter and judgmental about her mother’s decisions, so she doesn’t even make an effort. I can’t blame her mom for moving out. There is some distance between us and the characters. I didn’t connect with them the way I’d hoped, but it’s not as bad as some books I’ve read. At least it held my interest. Since Beth Wiseman is Beth Wiseman I’ll give the book 4 stars. Looking for a bunker hidden in the house, a hurting teen, and a finicky cat adds to the story line. $15.99. 352 pages. local sheriff, a good friend, asks for Brody’s help. At first, it seems like an open-and-shut case. As Brody digs deeper, he realizes the attack may be related to an organized crime trial Rebecca will be overseeing. With Rebecca's help, he compiles evidence involving cattle rustling, bribery, and dirty payoffs that shatter the entire community and put Rebecca directly in the line of fire. Brody expects to protect her. What he never expects is to fall for Rebecca all over again, or for a murder to throw the case wide open. Is Brody's faith strong enough to withstand not only deep-rooted corruption and cattle rustling, but also love? SCORNED JUSTICE is book three in Ms. Daley’s The Men of the Texas Rangers series, but it easily stands alone. I didn’t read books 1 or 2, Saving Hope or Shattered Silence and I had no trouble understanding what was happening. The writing is more told than shown, keeping the reader at a distance. As a result I didn’t grow to care for these characters. There is romance, action, suspense, and mysteries included in this cowboy themed romantic suspense. Readers will be kept guessing whodunit until the end. $14.99. 370 pages. PRICELESS STONES forces the reader to contemplate the truths that are communicated through Hebrew words. Author James Revoir tackles one word in each devotional, provides insight and analysis as to the importance of that word, and then invites the reader to respond to the Lord by means of Prayer and Dedication. The Prayers and Dedications are written out and demonstrate to the reader points of real-life application that can be put into practice. The Dedications are a breath of fresh air for the tired believer. The meanings and importance of the words are understood, and the impact that it should have on the believer made clear. Following the Prayer and Dedication, there are a number of Study Guide questions that are excellent for small-group discussion. Whether for small-group Bible study, or personal devotions, PRICELESS STONES will bring the Hebrew language to life. And you don’t have to know Hebrew to benefit from this excellent resource. I love devotionals, and this is a different twist on one, using Hebrew words as a basis. Recommended, whether you’re a lay-Christian, or a scholar. When Staci Hayes is rescued from a Mideast prison by navy SEAL Tristan Sawyer, she thinks the ordeal is over. But back in San Diego, a new threat arises. Staci has information that could prevent a hit on U.S. soil, and the terrorist will stop at nothing to silence her. Tristan insists on being her bodyguard, but his constant presence makes her long for things beyond her reach. Protecting Staci is the second chance Tristan needs to put the past behind him. Yet with a spy on the naval base, anyone could be a threat. Can he offer her safety…and love? Men of Valor: These navy SEALS were born to excel…. SEAL UNDER SIEGE is part of Ms. Johnson’s Men of Valor series, but it easily stands alone. Readers will want to read Promised to Protect first so they don’t miss a moment of this series—plus its Matt’s and Ashley’s story. “I did it for you." The chilling words in the text message have Julianne Grace fearing for her life. She's sure that her abusive ex-fiancé has killed two people—and that she's the next target. But will anyone believe that her presumed dead ex is really alive? The only man who can help Julianne is cool, aloof security specialist Bradley Stone. Not only does she need his protection, but he's also the link to finding answers about her ex-fiancé's death. And the closer Bradley and Julianne get to the truth—and to each other—the angrier the madman after Julianne becomes. One wrong move and they could both fall prey to the killer's deadly scheme. LIFELINE is the second book in Ms. Barritt’s Security Experts series, but it easily stands alone. Fans will want to read Key Witness though, simply because it’s a good book. Bradley Stone thinks Julianne is crazy. How is a dead man possibly murdering people—and threatening Julianne’s life? Not possible—and yet, it is. The person behind the texts and acts claim to be doing it for love—but if you loved someone would you try to kill them? LIFELINE is nonstop action from page one. Readers who love suspense will want to read this one. A page-turner. $5.99. 224 pages. 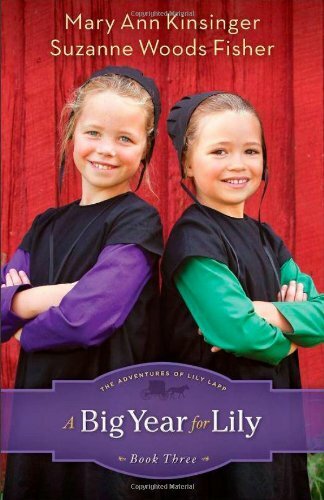 A BIG YEAR FOR LILY is book three in The Adventures of Lily Lapp series. Readers will want to read Life with Lily and A New Home for Lily first as the books are one continuing story. If you have a daughter/granddaughter or a friend who’s eight and up and would enjoy reading about Lily, don’t miss A BIG YEAR FOR LILY or any of the other books in this series. It’s Amish for a whole new generation. Recommended. Its worth 10 out of 10 stars (according to my daughter). $12.99. 288 pages. 5 stars. Shelby’s life isn’t glamorous, but it is predictable—and that’s the way she likes it. A survivor of her father’s violence, she has spent a lifetime creating a safe existence devoid of dependence. But her carefully managed world begins to break when, under staggering circumstances, she becomes a single mother to four-year-old Shayla. In a drastic attempt to escape her childhood’s influence, Shelby moves to Germany, but she quickly discovers how intimately linked memory and healing are—and how honestly she must scrutinize her past in order to aspire to a richer future. As she juggles a new job, a new culture, a new daughter, and the attention of an enterprising man, Shelby’s fresh start becomes a quest for the courage to be not only a survivor, but someone who prevails. IN BROKEN PLACES is the first book I’ve read by Ms. Phoenix. The story is well-written, but heart-wrenching. It isn’t set all in modern times, alternating between Shelby’s childhood and the present day. A victim of child-abuse, Shelby is desperate to start over—when her brother dies, leaving her care-giver to his young daughter. Shelby moves to a new country to work in a mission school. The book was hard to read at times, but it has good message, and is well-written. This is not a quick read, but one to be read slowly. It really gives you a heart for someone who is fighting demons not of their own making. $12.99. 368 pages. 3.5 stars. Find something to believe in . . .
Jamil renounced a life of jihad when he encountered the life-changing message of Jesus Christ. But his new mission as an itinerant health worker in the hills of Afghanistan is met with skepticism and even violence. Returning to Kabul, relief worker Amy Mallory is shocked by the changes in her organization—changes with dire implications for the women and children under her care. And concern for her former assistant Jamil weighs heavily on her heart. Special Forces veteran Steve Wilson faces off against the riots and corruption of Afghanistan’s upcoming election. He’s looking for something that will give his life purpose but is confident that he won’t find it in Afghanistan. All three are searching for love and freedom. But in a country where political and religious injustice runs rampant, the cost of either may be higher than they realize. FREEDOM’S STAND is the sequel to Veiled Freedom. I didn’t read Veiled Freedom first as I didn't realize that FREEDOM’S STAND doesn’t stand alone. It made it very confusing at times. The subject matter is very real. The book is rather difficult to read as a result. It was almost like reading a true event and not a work of fiction. The author did an excellent job with conflict and resolution and real life scenarios. However, she did jump point of views a lot and without clear transitions. I had to back up a few times to figure out who was talking. This is a book that you might have to read slowly, not a quick read. $13.99. 454 pages. 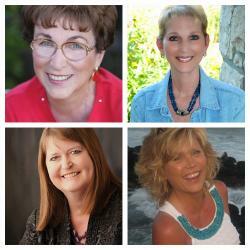 About Rosemary Cottage:Amy came to Rosemary Cottage to grieve, to heal, maybe even find love. But there's a deadly undertow of secrets around Hope Island . . .
My thoughts: I have long looked forward to reading Rosemary Cottage and it didn't disappear. Ms. Coble is a master at suspense and romance. This book will be going on my keepershelf. Don't miss Rosemary Cottage, or the first book in the series Tidewater Inn. and kids feeling overloaded with shopping trips, sign-ups, and new schedules. 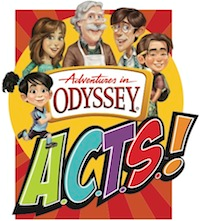 these daily devotionals, and get to know the Odyssey crew along the way. · A giveaway of 90 Devotions for Kids. Must have ten (10) people sign up for giveaway. Include contact information. Leave a comment. The end of summer is nearing and Charlotte has an opportunity to go on a girls' weekend with Hannah. Charlotte isn't sure, though, about taking time for herself. What if the family needs her while she's gone? Everyone maybe pursuing their own interests-- Bob has a part-time job at A A Tractor, Emily is babysitting a young cousin to earn extra money, and Christopher has joined the church youth group--but Charlotte would worry anyway. How will the family show her it can stand on its own two feet when she's away? Meanwhile, Sam starts classes at the community college, but it's not what he imagined. Will he be able to stick it out when the going gets rough? As the family grows together, they're all reminded that the answers to their troubles can come in unexpected ways. Charlotte and Bob are raising their three grandchildren after their daughter dies. The series shows how a loving family can get through difficult times and come out ahead. The older books are available through Amazon or you can wait for the new releases (beginning later this year) to get started on the series. Recommended for anyone who loves women's fiction. Growing Pains is number 23 in the Home to Heather Creek series. The books were previously released with different authors—such as Diann Hunt, Tricia Goyer, Leslie Gould and others, but they are being released starting later this year with a penname for all the authors in the series to share—so they appear to be written by one person. About Ragged Hope: "What a beautiful book ! So readable, the pages practically turned themselves. Ragged Hope is filled with stories; written for those who are weary, worn and wounded. It offers each of us exactly that-hope that God can do a mighty work even with those of us who carry the ugliest of scars." Where do we find hope when it's clouded by the ashes of other people's choices? What do you do when your life is affected by someone else's choices? Where is God when you are doing everything right yet, because of someone else, everything is wrong? This insightful and hope-giving guide will comfort, support, and encourage you through whatever situation you must face. Cynthia Ruchti, who has walked this road herself and has spoken to hundreds of people through her radio show, assures readers that God is ever present and offers unwavering love. There is hope, grace, and a future in every situation-even (and especially) those we did not cause but now live. Vetted by professional counselors and caregivers, this is the one guide you need to thrive no matter what you are facing. This is a book for anyone who has ever been negative affected by someone else's choices. And who among us hasn't? A must have in every church library and Christian counselor's office. Invaluable resource. Meet Cynthia:Cynthia Ruchti has more than three decades of radio broadcast experience with "Heartbeat of the Home" radio and currently serves as Professional Relations Liaison for American Christian Fiction Writers. Find Cynthia on the Web at www.cynthiaruchti.com. This book had three of my favorite authors in it, and it sounded like a fun read. I did enjoy it, loved the humor, and the premise. I won't tell you which story was my favorite and which wasn't, but I enjoyed the whole book and recommend it to anyone who loves novellas filled with historical romances and humor. 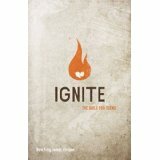 IGNITE is a great study Bible for Teens who are seeking God and what God’s plan for their life is. Available in a ‘traditional’ New King James Version, it is for those who want the more modern language than a KJV and not a NIV. It includes in depth tools for studying God’s word. Included in the Bible are summaries of each chapter with key information about the author, the time period, the purpose, and an application. There is also an area called “Spotlight” which focuses on a specific part of scripture and applies it to our life today. “Flashpoint” is a feature that focuses on issues that teens struggle with and ties that into scripture. “Soul Fuel” is another feature which includes highlighted Bible verses. There is so much more included in this Bible. Recommended for teens and young adults. $24.99. 1600 pages. Giveaway of two children's books if you leave a comment with contact information: Sammy Experiences God and The Pirate, the Princess, & the Precious Treasure. SAMMY EXPERIENCES GOD is a cute picture book relating to children. They hear the Bible stories, but why isn’t God setting bushes on fire to talk to them like He did Moses? Why aren’t they having dreams like Jacob? Why isn’t God meeting to talk like He did with Abraham? Sammy wonders the same things. And he goes camping and uses a rock for a pillow. He goes hiking and looks for a bush. He prays for rain and it’s a starry night. Sammy gets more and more depressed until Grandpa takes him fishing and has a talk with him about God, helping Sammy to understand. Little boxes in the story (on each page) helps the child to interact. How many frogs can you find on this page? What is your favorite Bible story? There is also a discussion guide for parents (or grandparents) to use when reading the book with their child. Recommended. $14.99 hardcover. 32 pages. This story is told through the eyes of a child. It will guide you through the stages of a family’s journey. You will read how through faith, prayer, song, family unity, and community, they faced t heir fears and the unknowns of cancer. As a fellow victim of cancer, I could relate to the topic of DEAR GOD, PLEASE HEAL MOMMY’S CANCER. And it was nice to meet the author at ICRS. My youngest child was three-years-old when I was diagnosed with breast cancer and we faced all the questions addressed in this book. What I really liked is that there were pictures included of the various machines in there so the child could “excerience” the journey. If the parent is going for radiation, then they can see the picture of the machine that does it. But when her life shatters around her and her reputation is left in ruins, Tara decides escape is the only option. She flees halfway across the country to dog-sit, but the quiet anonymity she needs isn t waiting in her sister s house. Instead she finds a knife with a threatening message, a fame-hungry friend, a too-hunky neighbor, and evidence of...a ghost? THE GOOD GIRL is an example of a book that you can’t judge by the cover. Just looking at it, I thought it would be a sweet romance. I didn’t notice the gun. And it is a sweet romance—but there is a definite mystery. This book dabbles in New Age mysticism, and it does get rather spooky at times. I really enjoyed reading Ms. Barritt’s THE GOOD Girl and I recommend it to anyone who loves a good cozy mystery. I did not figure out who did it in this book. I had my suspicisions – but I was wrong. It is a great read. $14.99. 254 pages. 5 stars. I enjoyed reading DOLLED UP TO DIE and couldn’t put it down. I had to find out what happens. The book does have a lot of New Age mysticism involved (included in the mystery) and parts are a bit scary. I did guess who might have done it early on, but there were enough red herrings thrown in to keep me guessing as to who really did it. I was initially right though. With tension that is matched only by humor, DOLLED UP TO DIE is the exciting second book in Lorena McCourtney's Cate Kinkaid Files. You won't find a place to stop and take a breath in this fast-paced story. Readers will want to read the first book, Dying to Read, before this (even though this one stands alone) to be brought up to date with how Cate landed in PI work. If you love cozy mysteries, then pick up DOLLED UP TO DIE. It is a great book by an award-winning author. $14.99. 320 pages. 5 stars. Houston- October brings a special opportunity to go behind the scenes with Kingdom Racing while taking in the excitement of the Grand Prix of Houston as it returns to the Reliant Center. For a LIMITED TIME ONLY, Kingdom Racing is offering exclusive ticket packages with VIP access to the Kingdom Racing Hospitality Unit and to meet & mingle with team personnel before the race. Are you ready to teach your children spelling? Spelling Mechanics is a new program for homeschoolers that can be used on a simple computer disc. The lessons are set up for teachers, such as for the kindergarten level, you introduce them to the vowels and it lists a bunch of activities for the teacher to do with the student. Introduce the individual vowels or consonants to students, demonstrate words that have the sounds in them, and share that every word will have a vowel. Spelling Mechanics includes games to be played with spelling, tells you what manipulatives you will need, and it includes website links for suggested lists of words for your grade level, and words for extra practice or reteaching. Tests are included that can be printed off for your student, and an answer key is included. Spelling Mechanics is not interactive for students. It is premade lesson plans so a busy mom doesn’t have to come up with her own lesson plans and tests for this subject. A great spelling program. Are you ready to teach your children grammar? Grammaropolis is a new program that involves books, music CDs and the internet. I couldn’t get into the internet program without buying a membership ($3.99 a month, $19.99 a year, or $39.99 forever) so I browsed the sections I could, which is a basic information about the parts of speech. A common noun is a person, place or thing. An action verb is action. I was sent two Grammaropolis books and one cd. Ø Vinny the Action Verb & Lucy the Linking Verb. This includes basic verb information – I’m darting! I’m sprinting! It also introduces state of being verbs such as I feel great. I’m being. Told in cartoon story form (a basic story, like you read, with a lot of cartoon bubbles all over the page). At the end of the book are worksheets the children can fill out. Answers are upside down on the bottom of the page. There also some bonus questions. Ø Nelson the Noun introduces common nouns, compound nouns, proper nouns, concrete nouns, abstract nouns and collective nouns. Pronouns are introduced as well. There are worksheets at the end, and the book is also in cartoon story form like the verb book. Ø The CD is by Doctor Noize. It uses all types of music sounds, such as rap, rock, country, ballad, etc to put the different parts of speech. The songs are kind of cute and catchy. Like the noun one has a chorus going “Noun, noun, so profound, everywhere you go they can be found.” The verb one uses verbs to also teach valuable life lessons, such as “You catch on fire, what do you do? Stop, drop, and roll.” Songs are included on adjectives, adverbs, pronouns, interjections, prepositions, and more. Ø Other books are available on adjectives, adverbs, pronouns, interjections, prepositions, etc, probably in the same format. You can find more information on the Grammaropolis series at http://grammaropolis.com/. There are also tests, videos, and performance tracking of up to five students. 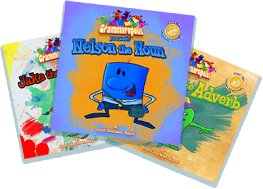 Grammaropolis is a fun approach for your elementary students to learn the parts of speech.